Dreaming of a residential destination that appeals to all your senses? Majestic Vistas by Emaar is the ultimate paradise in the Middle East where luxurious living meets every facet of your sense of well-being. Here is where you can SEE picturesque views of landscapes and fairways, TASTE the beauty of life through get-togethers in a signature ambiance, SMELL nature’s fresh air from sun up to sun down, HEAR the sound of happiness brought by a golf lifestyle, and TOUCH the supreme comfort of your cozy six-bedroom villa. Wake up to the awe-inspiring views of the 18-hole golf course set against the backdrop if the iconic Burj Khalifa and the vibrant Downtown Dubai. 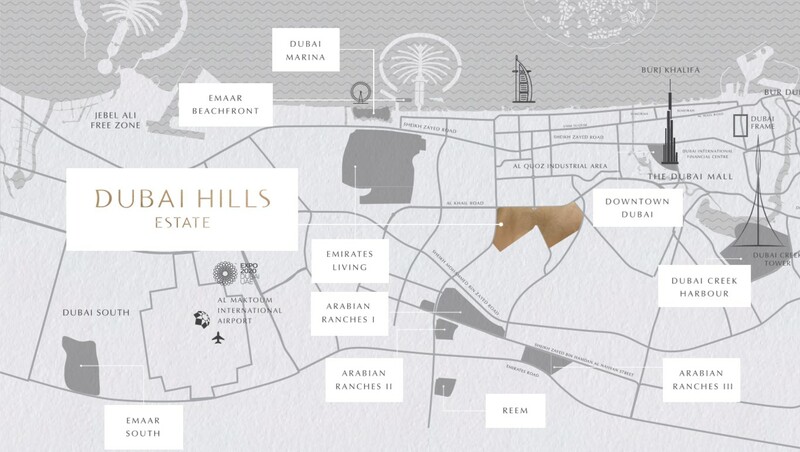 What’s more, with the 1, 730, 700 sqm of verdant open spaces at Dubai Hills Estate’s most special destination, the revitalizing scent of nature await you in every corner making it a place you can call home in the heart of the metropolis. Enveloped by green landscapes, Majestic Vistas at Dubai Hills feature a collection of alluring six-bedroom villas where there is ample natural light, a perfect balance of impressive proportions, and a an accent of contemporary interior design. A nurturing abode for the family, this is the impeccable place to make memories and celebrate the beauty of life. Apart from the Arabesque villa living, Majestic Vistas villas in Dubai offer a myriad of reasons for everyday celebrations. Take delight in your own private garden; two kitchens; formal and family living areas; children’s playground; meticulously constructed lawn and walking trails; world-class retail, dining, and entertainment facilities for the whole family, and many more. Ground Floor – 4124.55 Sq. ft.
First Floor – 4092.688 Sq. ft. Ground Floor – 4640.58 Sq. ft.
First floor – 4505.16 Sq. ft.
Total BUA: 9,145.74 Sq. ft. Ground Floor – 5112.79 Sq. ft.
First Floor – 4542.62 Sq. ft.
Total BUA – 9,655.42 Sq. ft. Ground Floor – 5277.48 Sq. ft.
First Floor – 4758.66 Sq. ft.
Total BUA – 10,036.14 Sq. ft. Ideally located at Dubai Hills Estate which is touted as the Green Heart of Dubai, Majestic Vistas is home to lush gardens, meticulously designed fairways, golf side community, contemporary Arabesque villas, and a host of other exclusive amenities. This is where your sense of opulence, comfort, and well-being begins.